Your Kilter looks great! Glad you had fun with it. I'm playing with a worsted version right now. I finished Heladas today; I need to block it. A quick, happy knit. Thanks so much! 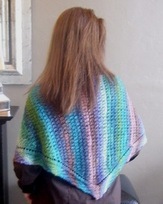 Preciosa feels a little thinner than Mal Worsted to me. I think the yardage is greater per 100g, which would make it thinner, yes? I have some in a lovely blue, too.